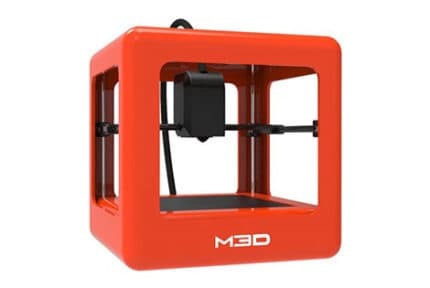 3D printers aren’t usually the cheapest products around, which means that it’s important to find one that’s actually worth your hard-earned money. Today, we’ll be examining the FlashForge Creator Pro – a mid-budget printer that’s the successor to the fan-beloved FlashForge Creator. Is the Pro an improvement, or should you stick with the classic? Read on to find out. The first thing to note is that the Creator Pro is a closed unit. 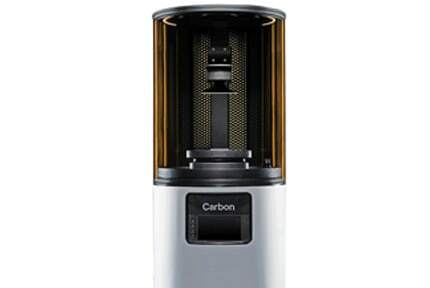 As such, it lacks the raw building volume of more open models, but it does ensure that you can maintain a consistent temperature at all times. Further, this removes the need for constant ventilation during the printing process. It’s also worth mentioning that this model comes fully assembled. Further, it boasts a universal power supply, so regardless of which country you’re in, you can count on it working as intended. Instead of being completely vertical, the controls are now at a 45° angle – a small touch, but a helpful one nonetheless. Now, while the original Creator had a wooden case, this one is almost entirely made of heat-resistant metal. As a bonus, the front door opens to almost 180°, making it easy to remove all but the largest prints. The FlashForge Creator Pro comes with two extruders, so you can print supporting structures, or even just two different colored materials at once. Better yet, because this printer supports PVA filaments, you don’t even have to have snap-off supports. Just soak the finished model in water and you’re done. That said, the Creator Pro doesn’t support a huge range of filaments. Other than PVA, you’re limited to PLA and ABS. 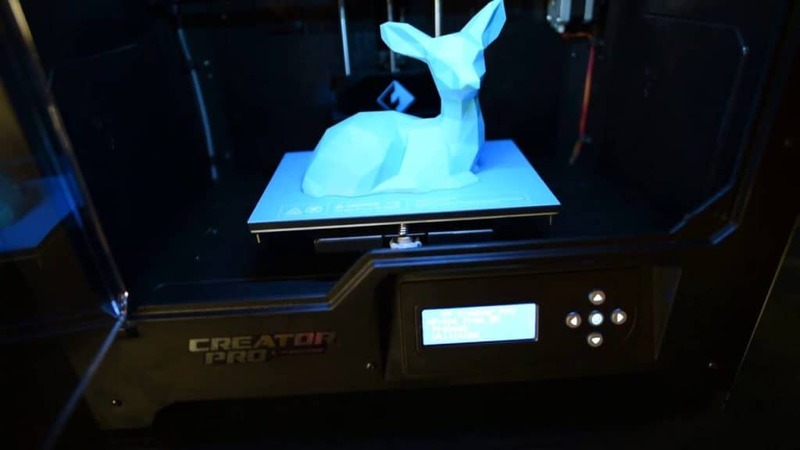 Don’t get us wrong – this is fine for people new to printing or occasional printers, but if you’re serious about experimenting with this tech, you’ll want something with a wider range of supported materials. 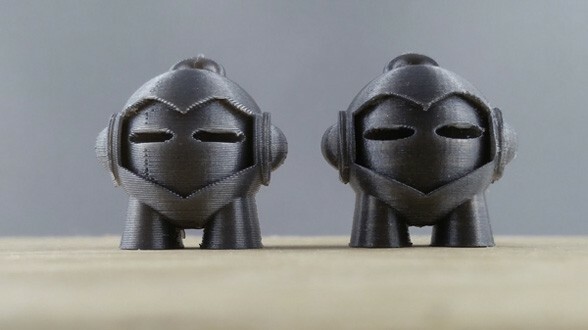 The layer resolution can be set between 100 and 500 microns. However, even at the highest setting, we found that small objects often had ragged edges or other imperfections. 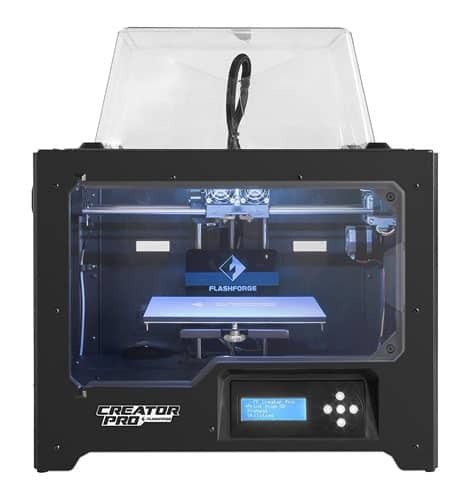 As such, the Creator Pro is better suited to creating medium or large items. This printer uses a 6.3mm aluminum build plate. It’s temperature-resistant and won’t warp even after prolonged exposure to heat. Of course, you can heat this to whatever temperature you like (up to 130°C), but we’d recommend about 90°C to prevent your materials from sticking. Unfortunately, there’s no way to automatically level the print bed. This isn’t a huge problem, it just means a few minutes of extra prep work whenever you want to print. This can seem a little daunting to beginners but once you get the hang of it, it’s really not a big deal. While this model doesn’t support WiFi connectivity as standard, this feature can be added using a WiFi SD card. It does, however, support printing from USB or SD cards, so you still have the most common options to choose from. 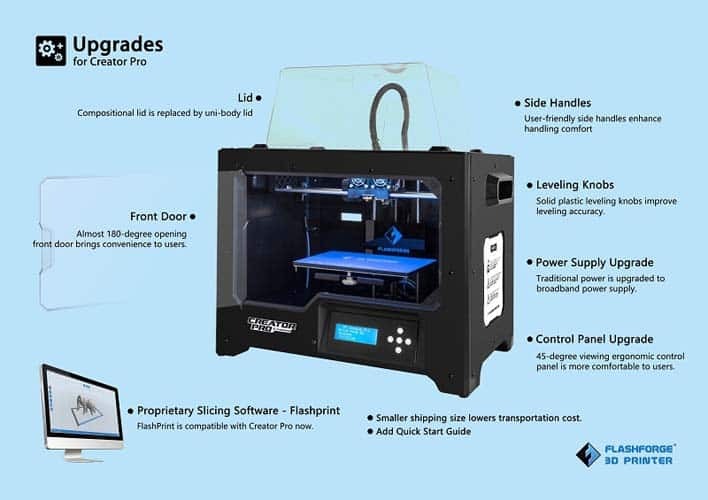 The FlashForge Creator Pro costs around $900 on its own, or you can throw in a copy of Simplify3D for an extra $30. Considering this software retails for about $150, that’s a pretty good deal. If you buy two printers at the same time, you can get this software for free, but without a further discount, this isn’t really worth it. 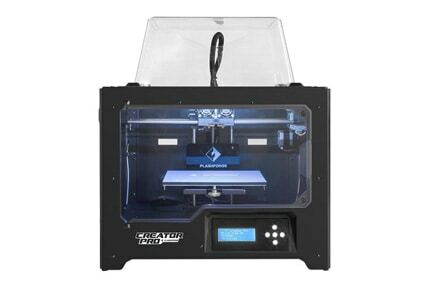 The price is about average for a mid-level printer like this one. Despite coming as a pre-assembled unit, all of the important parts like the extruders can be removed and swapped out if you’d like. Really, the maintenance costs shouldn’t be too high as long as you take care of the components. Of course, this depends on how much filament you use! 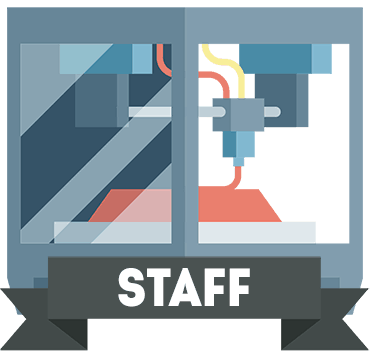 While the instructions that come with this model leave a lot to be desired, FlashForge provides detailed documentation, troubleshooting guides, and tips on their website. 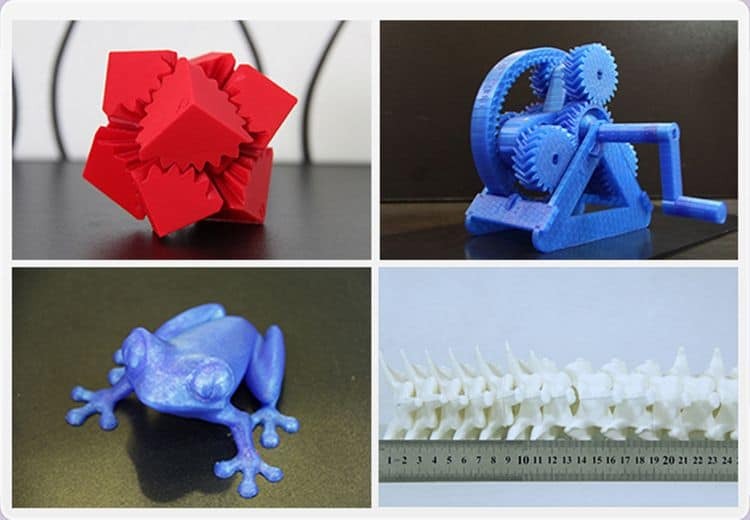 There are even tutorials for people who have never used a 3D printer before, which is great to see. The company offers a 30-day money back guarantee, as well as a guaranteed response to another customer support issues within eight hours. That’s pretty good, but there is a rather significant downside. While this product comes with a one-year warranty, it has a couple of stipulations. Firstly, you have to register the printer within 30 days of purchase. No problem, right? However, the warranty states that you (i.e. not a shipping company) have to personally deliver the product to the company for any repairs. So what’s the issue? Simply, the company is based in Hong Kong. Even if you live there, you’re potentially facing an hour’s drive. If you live overseas, the costs will be considerably higher and, in some cases, more than the cost of just buying a new printer. This is almost certainly intentional and can only be described as bad business. It’s a real shame considering that the printer itself is of such high quality. The FlashForge Creator Pro is a great little entry-level 3D printer. It’s reasonably priced, capable of handling the most common filaments, and includes a wide selection of customization features. However, it’s marred by a warranty that is intentionally difficult to redeem and as such, it’s important to take very good care of it. 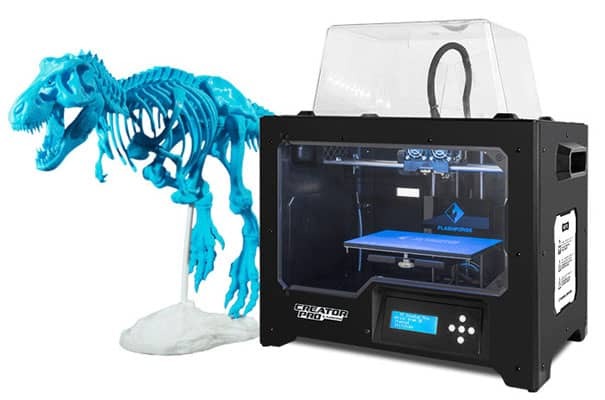 The FlashForge 3D printer is one of the better 3D printers out there, and it costs around 1000 USD so it is considered a mid-range 3D printer.